Most students who enroll in Yeshiva high schools where black hats and coats are the daily uniform don't expect much in the way of extra-curricular activities. 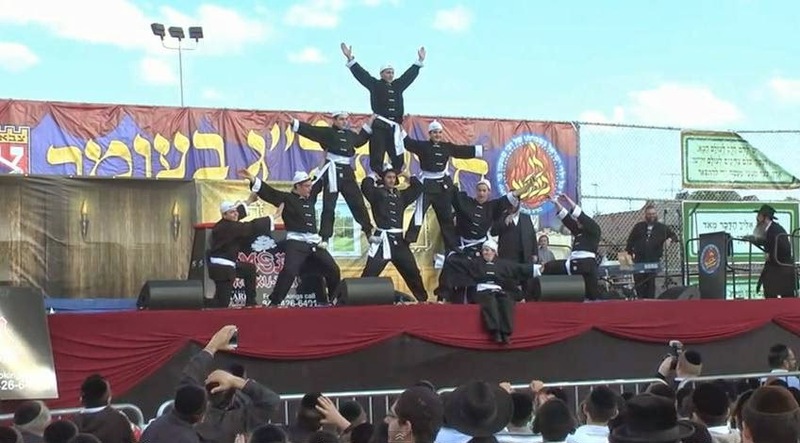 But students enrolling in Yeshiva Shaarei Arazim in Monsey, New York, are getting a big surprise when they find Chinese acrobatics and marching bands among the available choices. The yeshiva hired Frank Adams, a former Olympic gymnast who is now a Monsey resident, to train the members of the acrobatic troupe. According to Adams, the three times a week, two hours workouts are extremely aggressive. Mesivta Shaarei Arazim is also well known for its marching band, which has performed at countless weddings, dinners and other events for over six years. The band is taught by one of the secular studies teachers who also runs a professional marching band, and consists of approximately thirty students who perform in full dress uniforms. For most marching band members, it is the first time they have ever played an instrument. Below are two videos showing the boys of Mesivta Shaarei Arazim perfoming Chinese acrobatics on Lag B'Omer and playing in a marching band at a local wedding.